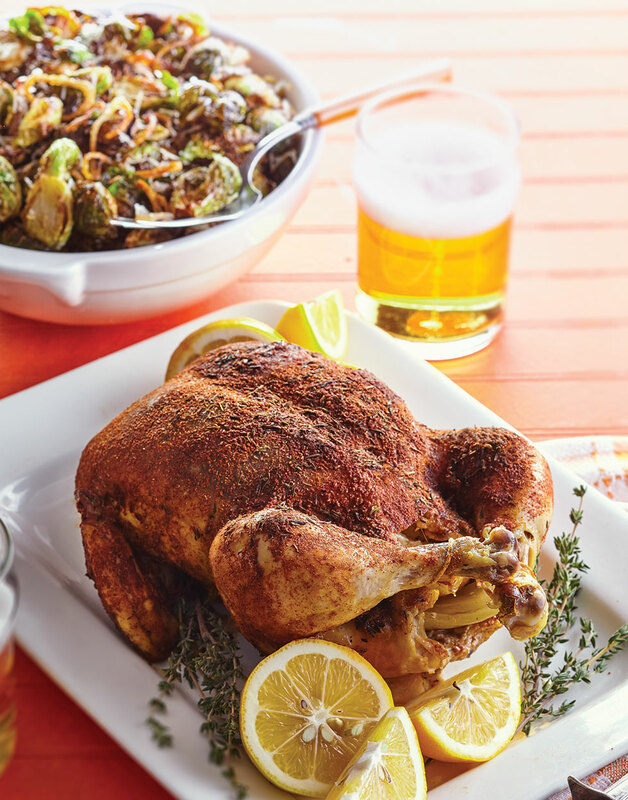 An Instant Pot whole chicken offers the same delectable, juicy meat that you love about a rotisserie chicken — right in your kitchen, without the flavor and browning additives of a store-bought bird. Pressure cooking a whole bird is quick, easy, and yields very tasty results. Unlike the black variety, white peppercorns are stripped of the flesh and skin of the pepper fruit, so only the seed remains. Because of this, white pepper is less complex, though it’s spicier, so it’s used in smaller amounts. Pat chicken dry, then generously season cavity and skin with salt, black pepper, and 1 Tbsp. thyme. Place onion, lemon, and garlic cloves inside cavity; tie legs together with kitchen string. Combine paprika, granulated garlic, onion powder, 2 tsp. thyme, 2 tsp. salt, white pepper, and cayenne for the spice rub; reserve 2 Tbsp. Combine remaining rub with butter. Loosen skin on chicken; spread butter mixture under skin. Sprinkle reserved spice rub over entire chicken, rubbing to cover completely. Add broth to Pot. Place chicken, breast side up, on steaming rack and carefully transfer to Pot. Close lid, lock Pot, select “Manual” (or “Pressure Cook”) setting and 23 minutes time. Pressure cook chicken until time is up, then natural release, 10 minutes. If lid hasn’t unlocked, release excess steam and remove lid. Remove chicken from Pot and rest 5 minutes. To prevent the spiced butter from leaking out, separate the skin from the chicken without creating holes. Rubbing the spiced butter under the skin allows the meat to absorb tons of flavor and stay super moist. Since the chicken skin doesn’t brown under pressure, sprinkle it with spices for visual appeal.